REST IN PEACE BUDDY YOU WILL BE MISSED. THIS IS MY FRIEND THAT PAINTED MY ENGINE BAY HE WAS JUST AT MY HOUSE ON THE BIKE THE NIGHT BEFORE MY PRAYERS GO OUT TO HIS FAMILY. My sympathies go out to the family and you bro, R.I.P. and God Bless. Seems like there is always an accident there. I had a coworker/friend die there on a bike 14yrs ago. Sorry to hear about this! Family and Friends are in my prayers! Sad thing to hear! May he R.I.P.. The Fucked up thing is that with all the State Taxes,fees and road tolls we pay every year, and the local GOV haven't make any changes yet to help avoid all these people from getting killed on that particular exit!! that's just plain and simple carelessness from the local city officials part. People should gather in a mission from that City and make the city officials sign a petition to start making construction structure changes on that particular curve to put a stop to people getting killed and thrown over the curve, just like they did couple years back on death valley road going to Key West Fl. Frank I dont think there is anything that can be done to make these overpasses any "safer". remember these are city streets.what are they going to do put soft wall barriers like at the track? I had a similar incident occur when a squid that was riding with us southbound on okee to I-75 decided to try and keep up on the overpass.when I got home my phone was blown up with phone calls.he hit the wall and fell over.we as fellow riders take that risk when we decide to push on the streets.its the same thing with cars street racing instead of going to the track.its alot safer on the track.I had a bad accident at homestead last july on my track bike and if it would of happened on the street i probably wouldnt be here today.those are the risks we take when we take it to the streets.my heart goes out to his family and friends...R.I.P. sorry about your friend. it's crazy how many bikes keep crashing in that spot. I got your point, but at least to make that wall a bit more higher so people don't go over it when they hit it and have more chances of survival. Hey everyone the service info is as followS. 7801 nw 5th st at 7pm on Sept 26, which is monday . Any one who wants to be a part of this is invited , however you might of know Erik, Thank You. RIP BROTHER WE MISS YOU. To those that don't already know or remember so well. 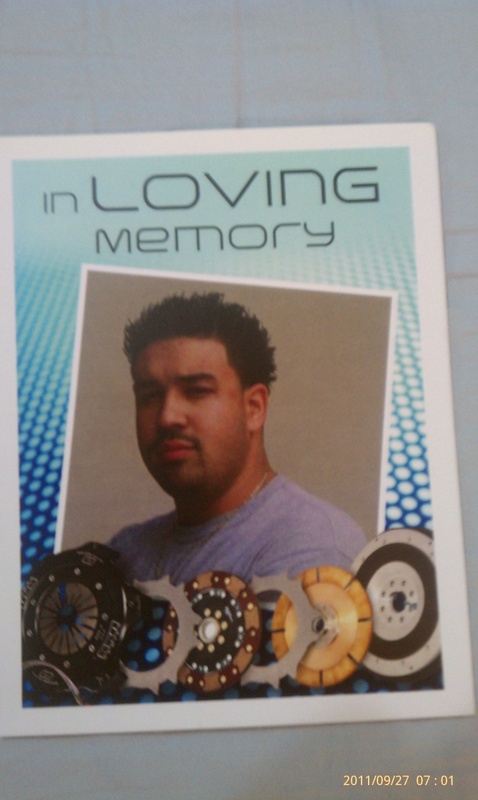 I lost my brother ERIK REIS JR in a motorcycle accident on Sept 21 of 2011 on I-95 and fell 60 feet over . I appreciate everyone who still keeps him in your heart and thoughts as these long days god has blessed us with everyday go by without him.. I see pictures and comments people make of him not being here and it just hurts all over again.. I'm not here to vent to everyone about losing someone i love dearly, i know everyone does it , but all[/u] i really wanted was the word to reach everyone out there that cared for my brother the same way i do and always will. I wanted to show him some love at his sign that i had the city put up for him on the side of I-95 going north from Miami. [/u] I wanted to bring him some things for his sign to let him know we still care..